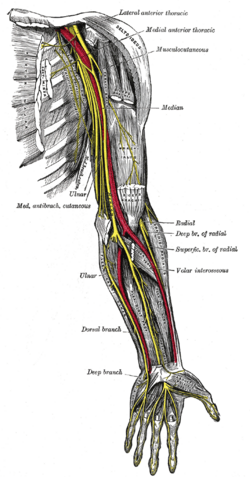 In the anatomical drawing above, nerve fibers are highlighted in yellow. A nerve is an enclosed, cable-like bundle of axons capable of transmitting electrical signals called nerve impulses or, more technically, action potentials. 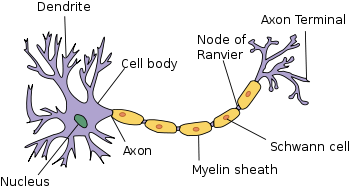 (An axon is the long, slender projection of a neuron.) Found in the peripheral nervous system (which excludes the central nervous system comprising the spinal cord and the brain), nerves form a vast and elaborate signaling network carrying information from surface and interior sensory endings to the brain and from the brain to the muscles and glands. Nerves are interconnected at junctures called synapses, where usually the electrical signals from one nerve are converted to chemical signals in the form of neurotransmitter molecules passed on to the next nerve that converts the molecular signal back into an electrical signal. A second, less-common type of synapse directly transfers an electrical signal between nerve endings. Nerves are found in both invertebrates and vertebrates, with the invertebrate nervous systems being much simpler than vertebrate nervous systems. The study of nerves in invertebrates has yielded much of the insight about the functioning of nerves that has been applied to understanding nerves in vertebrates. The nerves of horseshoe crabs, squids, and cockroaches have all been sources of insights about nerve function; the very long axons of the squid have been particularly useful. From the simple networks of nerves in invertebrates to the more complicated nerve networks in vertebrates all operate in harmony to coordinate the body's interaction with the environment. Vertebrate nerves are the focus of this article. The idiom "nerves of steel" is applied to someone who is not easily frightened or rattled. Nerves may be classified by the direction of the signal they transmit. Afferent nerves (also known as sensory nerves) convey sensory signals to the central nervous system (that is, the brain and spinal cord). Efferent nerves (also called motor nerves) conduct stimulatory signals from the central nervous system to the muscles and glands. Afferent and efferent nerves are often arranged together, forming mixed nerves. The components of nerves that are responsible for their function are electrically excitable cells called neurons. Neurons have four main components: a soma, or cell body, which contains the nucleus; one or more dendritic trees that typically receive input; an axon that carries an electric impulse; and an axon terminal that often functions to transmit signals to other cells. Signals are transmitted via chemical or electric impulses across a synapse (the junction between neurons). The fundamental process that triggers these impulses is the action potential, an electrical signal that is generated by utilizing the membrane potential of the neuron. Although neurons are sometimes referred to as nerve cells, this term is technically imprecise since many neurons do not form nerves. In the central nervous system, for example, bundles of axons are termed tracts rather than nerves. Moreover, nerves also include the glial cells that fill the spaces between neurons, forming a myelin sheath around the axons. Myelin, a whitish material composed of proteins and fats, insulates the nerve fibers, allowing for a more rapid conduction of the signal while decreasing the amount of energy expended. In addition to neurons and glial cells, nerves contain connective tissue that bridges the fibers as well as associated blood vessels that supply the nerves with blood. The structure of a nerve. Each peripheral nerve is covered externally by a dense sheath of connective tissue and accompanying blood vessels called the epineurium. Underneath the epineurium is a layer of flat cells that form a complete sleeve (the perineurium). Perineurial septa extend into the nerve and subdivide it into several bundles of fibers. Surrounding each fiber is the endoneurial sheath, a tube that extends, unbroken, from the surface of the spinal cord to the level at which the axon synapses with muscle fibers or terminates in sensory endings. The endoneurial sheath consists of an inner sleeve of material called the glycocalyx and an outer, delicate, meshwork of collagen fibers. While most nerves connect to the central nervous system through the spinal cord, the twelve cranial nerves connect directly to parts of the brain. The signals carried by nerves, sometimes called nerve impulses, are also known as action potentials. They are rapidly traveling electrical impulses (up to 120 meters/second) that typically begin in the cell body of a neuron and propagate rapidly down the axon to its tip or terminus. The signals cross over from the terminus to the adjacent neurotransmitter receptor through a gap called the synapse. The narrow cross-section of the axon lessens the metabolic expense of carrying action potentials, but thicker axons convey impulses more rapidly. To minimize metabolic expense while maintaining rapid conduction, many neurons have insulating sheaths of myelin around their axons. In the peripheral nervous systems of jawed vertebrates, a particular variety of glial cells called Schwann cells (also referred to as neurolemmocytes) provide myelin insulation. The myelin sheath enables action potentials to travel faster than in unmyelinated axons of the same diameter, while using less energy. Damage to nerves can be caused by physical injury, swelling (for example, carpal tunnel syndrome), autoimmune diseases (for example, Guillain-Barré syndrome), infection (neuritis), diabetes, or failure of the blood vessels surrounding the nerve. Pinched nerves occur when pressure is placed on a nerve, usually from swelling due to an injury or pregnancy. Nerve damage and pinched nerves are usually accompanied by pain, numbness, weakness, or paralysis. Patients may feel these symptoms in areas far from the actual site of damage, a phenomenon called referred pain. Referred pain occurs because signaling is defective from all parts of the area from which the damaged nerve receives input, not only from the site of the damage. Spinal nerves are given letter-number combinations according to the vertebra through which they connect to the spinal column. Cranial nerves are assigned numbers, usually expressed as Roman numerals, from I to XII. In addition, most nerves and major branches of nerves have descriptive names. Lodish, H., D. Baltimore, A. Berk, S. L. Zipursky, P. Matsudaira, and J. Darnell. 1995. Molecular Cell Biology, 3rd edition. New York: Scientific American Books. ISBN 0716723808. Peters, A., Palay, S.L., and H.D. Webster. 1991. The Fine Structure of the Nervous System: Neurons and Their Supporting Cells, 3rd edition. New York: Oxford University Press. ISBN 0195065719. This page was last modified on 3 September 2008, at 15:53.